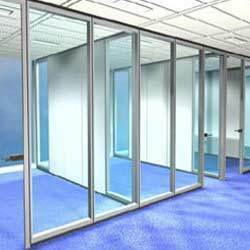 We are actively engaged towards offering an exclusive assortment of Aliuminium Framed Glass Partition. These products are offered in variety of sizes, shapes, designs and other specifications according to the emerging need of the valued customers. The mentioned products are appreciated amongst the clients for its high strength, corrosion resistance, easy installation and durability. Om Aluminium & Glass Fabrication House came into existence in the year 1995 and since then it has attained a position as the leading organization manufacturing, supplying and providing services of the wide assortment of products like of Aluminium Windows, Aluminium Partitions, Home Carpet, Glass Sun Films, POP Ceiling, PVC Fresh Door, Designer Glass, Modular Kitchen, Wall POP Design, House Door Panel, Toughened Glasses, UPVC French Doors, Vision and Vertical Blinds, Iron Door Works, Walls Glass Work, Steel Door Works, Glass Fitting Service, Curtain Walls Glass Work and Tiles Installation Services. The products are highly appreciated for its features such as fine finish, durability, available in variety of patterns, fire, weather resistant, easy maintenance, economical, maintenance free and completely tested quality.